Update 24/7/14 – Given the rumours flying around today about Government announcing the possible acceleration of this project, we have made this earlier post “sticky” while we write up a new post on the issue for tomorrow. 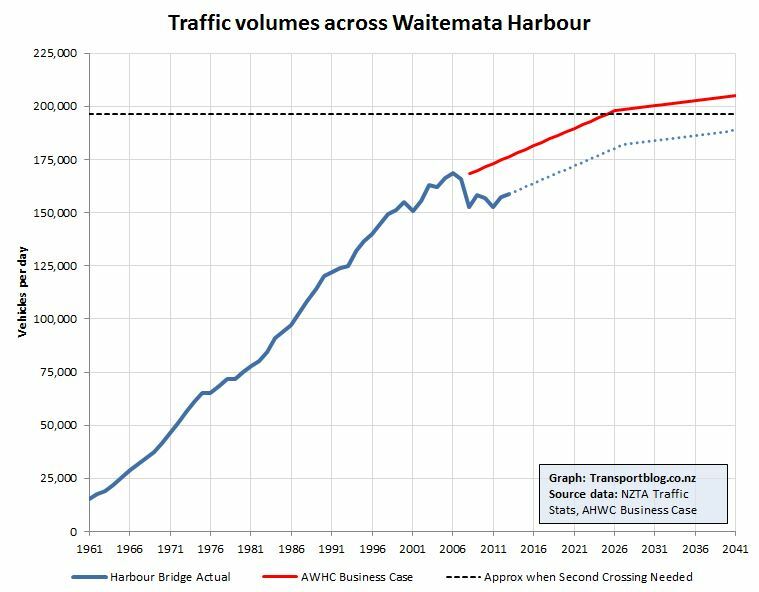 This is the first of a couple of posts looking more closely at the Additional Waitemata Harbour Crossing project and how we could do it differently. The complete lack of merits of this project aside, a major issue with NZTA applying for designation for this project is the impact it’ll have on the redevelopment of land around areas such as Cook Street. Simply closing that offramp would free up a lot of space currently wasted on massively oversized roading for housing development. However, much as the Eastern Motorway designation has resulted in large tracts on land being empty wasteland for decades, I can foresee this having a similar impact on affected innercity areas. It’s already meant that the Victoria Park overbridge wasn’t undergrounded (as proposed at the time – for a mere $10 million) due to NZTA wanting to allow it to connect into this project. It’s basically a terrible project that will hang over the city for decades, and always used as a reason by NZTA and AT why road A, offramp B, empty lot C can’t be downsized or repurposed because it will supposedly need to connect into this project. The opportunity cost is massive, if Auckland is forced to go down this path then personally I think all the work in recent years that has started to turn Auckland into a liveable urban centre will be thrown out the window. +1000. Time for NZTA to fess up and kill this dog dead. Yes. But tragically the dinosaur pollies aka George Wood et al have a faulty chip in their brain which needs resetting. They cannot get their heads around the idea that we don’t need a new motorway across the harbour. They’re the last remnants of the old brigade who see Auckland as a hindrance to movement: John Banks and Maurice Williamson; various rural MPs; proponents of the Eastern Motorway through Hobson Bay. There’s a strange species of Aucklander who can still be heard scoffing that they haven’t been to Queen St in years. They’re deeply anti urban – hence for them destruction of inner city neighbourhoods is a good thing. It means they can get from Pakuranga to Omaha faster. “who can still be heard scoffing that they haven’t been to Queen St in years” – Yes and yet will feel quite entitled to tell you that it is full of $2 shops (is Gucci now selling for $2?) and empty after 5.30pm and on the weekend. I am in the CBD day in day out and it is busy until late. It also has a great buzz on the weekend. Pedestrian counts on Queen St show that Saturday is now as busy as weekdays, but just not as peaky. For humans that is. Not cars. What is the ratio of cars to pedestrians on Queen St now? Waiting for AT to give me the car data….. and the journey to Education by mode data…. There are plenty of times of when the ratio of a cars to pedestrians on Queen St is less than one.. just counting pedestrians on the road, not the footpath. The CBD is kicking.. way better than say 5 years ago. They could have undergrounded the Victoria Park viaduct for only $10 million? What a wasted opportunity. It would probably cost hundreds of millions to do now. The VPT cost $400m. The Viaduct is four lanes not three, so figure it’d cost over $500m for construction of another four sub-subterranean lanes. Maybe another $50m for removal and rehab for the existing structure. Even allowing for inflation, that $10m would’ve been one hell of a bargain. That’s not quite true, Patrick is referring to the marginal cost of building the VPT as a six lane tunnel for both directions, less the projected costs of maintaining the viaduct. The cost of having built a bigger VPT at the same time less the money spent on upgrading and maintaining the existing over bridge meant it would have only cost an extra $10 million on what was spent at the time. NZTA declined to do this as they didn’t know how the AWHC would link in, or whether it would be a bridge/tunnel. Great post. NZTA have always struggled to understand that effective transport solutions focus on the movement of people and freight, not single occupant cars. Another key point: as well as there being little intensification expected on the North Shore, there is also no expansion in the urban limits under the Proposed Unitary Plan, unlike for west and south Auckland. So there isn’t a lot of greenfields growth either, once Albany and Long Bay are complete. The limits have been expanded further north, around Silverdale and Orewa, but not on the North Shore itself. Overall, population growth is likely to be much more substantial to the west and the south (and centrally) than it is to the north. Whilst the actual numbers of population increase on the core parts of the Shore are likely to be comparatively low, Browns Bay and Takapuna will have a density increase that will be quite significant for them. We can already see it with the Norfolk Apts in BB adding 42 one and two bed homes to the flat. I would imagine that as the crappier bits on the flat in BB get developed over the coming years they will all be apts with retail below. I welcome this change. Density done well will be great for the area. Bring on the NS train line! (and a Bridgeway style cinema for BB too please). Perhaps this is a little , or entirely, naive, but as I now spend my “self employed” days, walking the North Shore, shore, the one thing it seems to be crying out for is intensification. As we’re all “one city” now, isn’t this simply a case of democracy in action? As “hardly anyone” actually lives there, hold a vote, all in favour of North Shore intensification? The ayes have it. Sadly the Shore is destined for the opposite thanks to some concerted lobbying – a decrease in permitted density. Much like the far east of the isthmus. The rest of the region should demand a matching withdrawal of any more investment in infrastructure and amenity. Put the focus West and South instead. The San Francisco experience is instructive on many levels. BART is in a tunnel under the bay; this was unaffected by the quake, unlike the bridge, narrow rail tunnels are not only much cheaper to build but also considerably easier to make resistant to damage. Furthermore having this complementary system ready and functioning played a big role in keeping the city going again after the surface disruption to the road network. Home grown electric powered rail also offers another form of resilience; against oil supply or price shocks. At 5.3b we can build the CRL AND Rail across the Harbour. I am not sure that a rail tunnel is easier to earthquake proof than a bridge. That said, a modern rail tunnel is likely to be designed to resist earthquakes much better than the 1950s (“we don’t have earthquakes in Auckland”) AHB would be? Easier to earthquake proof than a much bigger diameter road tunnel. And cheaper, and cheaper and easier to operate safely. Especially without needing to ventilate for exhaust fumes. We don’t, really. Certainly not ones of consequence. The return period for an earthquake with real damage potential in Auckland is thousands of years. Yep, more likely to have the bridge and approach roads damaged by a Tsunami coming from somewhere else’s earthquake (Kermadec trench) or a nearby undersea volcanic eruption as Rangitoto is believed to have caused several of in its time, than some earthquake. And Turkey has recently built a large undersea metro rail tunnel right through the main fault line in Istanbul – and which is designed to survive a pretty strong quake so it can be done if you have to. A volcano is more likely, but a rail tunnel appears (at first glance) more resilient in the event of that possible disaster. Agreed, but even then a tunnel wouldn’t help much, the volcanic ash would short out the overhead wires above the tracks used by the electric trains [south of the bridge anyway]. So no electric trains as a result. Of course, the tunnel itself would be fine – although the Tsunamis from any [under water] eruption could flood the tunnel via the open “end” on the shore like what happened in NYC during Hurricane Sandy. What are the ongoing maintenance and depreciation costs for AWHC when compared to the ongoing maintenance, depreciation and subsidy costs of the entire rail network? With an unesculated base cost of double the CRL I’m guessing it maybe an even run thing. Three times, un escalated CRL base cost is about $1.8 bil. Ok, so it’s almost six billion dollars to do zero for the strategic motorway network, but rather just increase traffic capacity from the lower north shore to the CBD… Which is only congested at peak times on weekdays, maybe 40 weeks a year. So is there is any chance our city streets could handle turning the whole harbor bridge into an off ramp to the CBD? Where does the traffic go, are we going to cut down the trees in Victoria Park and widen Fanshawe St to ten lanes? Where do the cars go after that, can’t demolish skyscrapers to widen customs st, Victoria, Albert etc. And then what, where do the five or six new jumbo car parks go to leave the cars in all day? Are we tearing down more skyscrapers to build those? What would the city be like if we did. Surely there must be a cheer way to get peak commuters to the CBD, say a rail tunnel costing four billion dollars less? No traffic issues there, tunnels run under the street. And no parking to worry about, commuters simply walk from the station. On the second point, “Congestion on the Northern Motorway”, further work should be done to determine if the bridge is actually the cause for congestion. In the morning, I dont think it is unless you can attribute it to the pinch point just prior to the Onewa onramp. Likewise in the evening, the on issue is getting on and issues re the merging traffic at Curren Street which would be helped if that left lane through St Marys Bay was a bus lane. But to benefit from it, we will have to increase every other part of the motorway system by 50% or more. This should cost tens of billions, and will make the NZTA and Auckland Transport very happy. Their happiness is worth billions. More seriously – we need to increase fines for trucking companies using overweight vehicles on the clip ons. Something in the order of $10,000 for the first offence, $20,000 for the second, and more for the third. A significant sum of money being charged would mean that the companies would pay attention, the clip ons would not be used, and there would be no extra maintenance or aging concerns. The trucking companies would whine, but they don’t deserve to be taken seriously. They still have use of the inner lanes. I think you need to clarify whether you mean vehicle capacity (which I think you do) or person capacity. All other issues aside, a full lane of buses could carry more people than the other 4 peak direction lanes combined at 1.2 persons per vehicle. Would it be possible to get the Herald to publish a Transport Blog post each week? If one blog post was offered to the Herald free each week, would they publish it? It would be great if more people got to read this content, and I imagine these sorts of headlines would be heavily read even if it is by people who disagree. Balanced reporting on transport isseus in the NZ Herald? Tell him he’s dreaming. Not in the Herald, that’s for sure. Sad but true. NBR sometime posts blog posts from the likes of David Farrar, Lance Wiggs, Rowan Simpson etc. Transport Blog posts on the NBR site would certainly set the cat among the pigeons. George Wood’s response when asked to validate the assertion that AWHC stands by itself. TB in the herald good idea. until last month I googled (new Auckland harbour bridge) I ended up in this site which I read everything and totoly agree with almost everything. I also thought trains where museum fun rides until I went to sydney. So it is good idea giving aucklanders news around transport projects. Anyway I always have thought we need a new bridge (not tunnel) not yet anyway. Now our beloved bridge was poorley designed done on the cheap and well nothing was thought through. I don’t think it is worth building or upgrading any more inforstructor around it. I think we should do the CRL 1st and then make a whole new plan around harbour crossing and CMJ connection. Beacaus the whole area around Victoria park and the harbour bridge is a mess. It is sad that the best source of news about Auckland’s transport issues is a blog run by volunteers. The good news is that people like yourself are slowly waking up to what Auckland needs, and asking for it. Things will change, maybe slowly, but they will change. Why would we want a second bridge when tunnels are protected from the weather and can deliver a world class rail service to the North Shore? The wastewater industry has a number of tunnel projects that have been delivered on time and on budget. Why should rail be much different? The tunnel is just somewhat bigger. Singapore manages to have 2 such projects on the go at any given time with few problems. It’s really a new epoch for NZTA, when their plans are subjected to such well-reasoned scrutiny. It’ll be nice when we have a change of government and NZTA are allowed to better embrace other forms of transport than simply privately-owned, rubber-tyred ones. More people arriving more quickly into the already congested Esmonde Road in Takapuna. Happy happy days! And the adding of extra lanes on the Northern motorway will have to start from where? But wait, someone will have a really clever idea and for some unknown reason (apart from to flog more vehicles) suggest that plug in vehicles use the bus ways. Well it’s unlikely to do anything at all for those transiting from north to south, because it only connects to exactly the same lanes in Spaghetti Junction as we have today. Still two lanes to the south and one to the west and east, and vice versa (actually that’s a slight reduction, as there are currently four lanes in the viaduct). Unless they add further billions to include an expanded spaghetti junction (how? ), widening of the southern motorway, a new Newmarket viaduct, even more extra lanes on the Northwestern, etc, then there is no gain for through traffic. In net terms, all this proposal achieves is shifting the same number of state highway lanes from the bridge to the new tunnel, which allows the bridge to act as one huge off ramp to Shelly Beach Rd, Fanshawe St and Cook st. Even if two of the bridge lanes are made bus lanes, that is still six lanes of traffic linking to central city streets. So your second point is correct, it will increase capacity for commuters to the CBD, and that is the problem. Auckland neither wants more traffic downtown, nor could handle it. How would Fanshawe St cope with double or triple the traffic at peak times? And Cook St, and Jervois Rd? There is zero scope to increase the traffic lanes on the streets the bridge links too, so why do we want more traffic capacity coming off the bridge? And after that, where do these cars go? Where are we supposed to put another four or five Downtown car park sized parking buildings? The net outcome is just an increase in traffic capacity for commuters to drive to the CBD, but not through or within it, at peak times. We don’t want or need that. The question is simple, if we add six lanes across the from the north, but add nothing south of the harbour, then where does the traffic go? Thee see really only two answers, we end up with lots of extra traffic exiting to the CBD, or we aren’t expecting any extra traffic at all. In both cases you have to ask why would we spend billions to achieve that outcome? I suppose you could argue that they should therefore scale back the bridge lanes, maybe take it down to a couple of bus lanes and maybe one or two traffic lanes each way to the city. But then you are spending over five billion dollars to add bus lanes to the bridge… We could build a whole north shore metro network for that kind of money. That’s the problem, this is an insanely expensive mega project that either floods the CBD with commuter traffic it can’t handle (and doesn’t want), or if it doesn’t do that it achieves nothing at all. Well, to be fair it would add some partial bus lanes to the bridge (shared with general traffic to Shelley Beach and Curran, according to NZTAs published plans), but there are a lot easier ways to do that than a five billion dollar motorway tunnel. It all seems blindingly obvious, doesn’t it? Do you think the AWHC cheer squad (Wood, Brownlee et al) are wilfully oblivious or are they actually that divorced from our shared reality? Wow, it sure does seem like a waste of money- for $5.3B I would expect a real and noticeable difference to be made in transport outcomes, not just a few kilometres of motorway and more traffic and pollution in the CDB. As everyone on the Shore knows there is capacity aplenty on the actual bridge – it’s fast, affordable and connected public transport that is missing. Yip. You only need to check NZTA’s own motorway cameras at 8:30 in the morning and you will see the southern motorway (SB) is already congested. Just where do they think this extra N-S traffic will go? 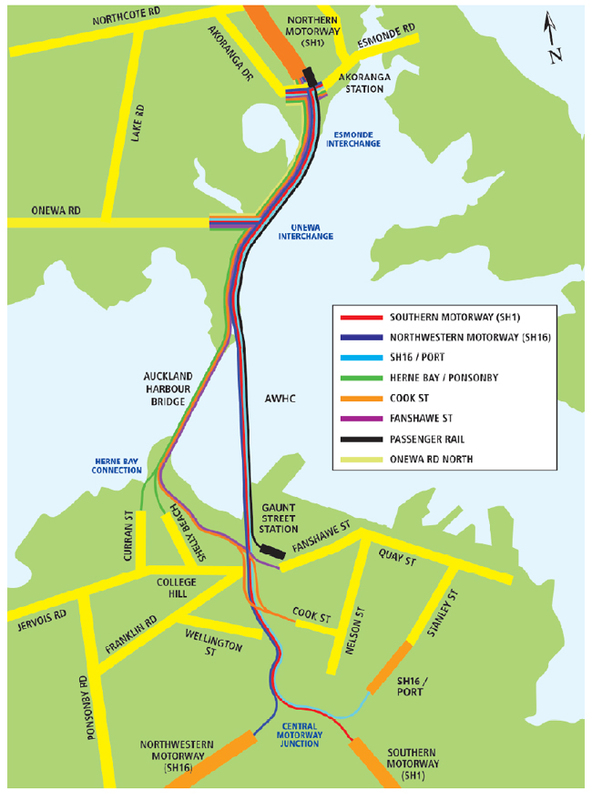 I think you just need to look out West to see what they think the solution will be, Waterview project has necessitated several billion worth of motorway widening down the NW only a few years after the last round of widening took place…. Their is a final point around the complexity and cost. Check the Boston big dig for an example of how these tunnel projects can blow out. The cost of complexity should also be considered. Check Boston big dig for an example. You only need to listen the radio each weekday morning to hear where the congestion is: Grenville Road to Onewa Rd. The AHB typically flows just fine. 2) Their political masters love new roading projects; it keeps the political donations from the roading forums flowing, is regarded as an excellent investment in the future (more roads = economic growth, right? ), is seen as a vote winner and provides many good media opportunities. 3) NZTA is directly funded by fuel tax and road user charges. They are acutely aware of the implications of this funding mechanism, hence they are reluctant to encourage anything that results in less vehicle use. Bevan, I think you’ve made two very interesting points there about NZTA. First, it is indeed in their DNA. This reminds me a little of the 1980’s, when the old NZED wanted to build hydro dam after hydro dam, regardless of demand and cost, because “the workforce was in place”. Another common factor – expensive capital plans being justified by projections of endlessly rising energy demand that just had to be met. Maybe the AWHC is just the latest in a long line of ‘Think Big’ projects that have arrived courtesy of Wellington. Secondly, is it reasonable to expect NZTA to make rational transport decisions when their funding incentives are to maximise fuel use and truck mileage? It is surely no great mystery then that we get endless motorways and road expansions being proposed by them. If we are to get sensible outcomes out of NZTA their incentives need to be turned around 180 degrees – maybe we should fund them on the basis of carbon emission reduction targets or savings in fuel imports instead. For those of you that are interested, I have some additional details on the cost of the AWHC here, including why it should cost more in the range of $2-3 billion. as unbiased as lawn bowls! This ties in a bit with the port problem too. Ports of auckland shifting out with northport taking over would lead to a large amount of heavy freight movements going from an inland port around kumeu somewhere over the greenhithe bridge to the north shore that way. With that the harbour bridge is relieved somewhat of its heavy freight traffic duties and will last longer. That being said we probably need another harbour crossing and there doesnt seem to be any other logical place to put it. A bridge will not be welcomed by residents on either side. A tunnel is the best option. mb, Tell us all about this heavy freight traffic on the Harbour Bridge. How many vehicles per hour is it? And for others tell me about the need for multiple lanes of buses- it’s a myth. There are multiple lanes of cars, but there is little congestion on the bridge especially north to south. And if you don’t believe me think about the maths of it. The northern approach from Northcote to Akoranga has three lanes and at peak it expands to five lanes at the bridge. What am I missing? In this scenario how can the wider stretch of road (the bridge) possibly become congested? And it isn’t! If we are going to have a debate about this stupid project then at least lets have a logically based discussion. If there is to be a transport solution for the Shore then light metro seems a far cheaper and effective solution. Overseas experience suggests that this would lead to intensification along the line and the benefits of the system would extend the whole length of the system. It would provide an alternative for those moving up and down the Shore that the busway doesn’t -what for example is the purpose of delivering people to Albany station that is miles from anything?. Fortunately we have at least one councillor on the Shore (Derby) who is taking a far more enlightened view than the need for a second road crossing. I wonder how much perspective our planners bring to the evaluation of these projects? I am appalled to read that AT in evaluating park n ride are holding up Wellington as an aspirational target. My recollection after 5 years of living in Wellington is that park n ride is necessary for the rail system because the lines were built as far away from population centres as seemed possible. I am worried that many of the near north shore suburbs will be irreversibly worsened by increased traffic flow and it will be unnecessary. That worsening will occur because people will use cars because it will be so attractive to because effectively they will be subsidised by free roads and undercharged parking facilities. The point of there being comparatively little intensification on the inner shore is also well made. I know that Takapuna has significant projects about to start but in the scheme of things population increase will be relatively insignificant. Hi taka~ite. My first comment there was more of a frustration comment about the port being in the middle of town. Moving it out would help a lot, even reduce the need for a second harbour crossing by taking the heavy freight off the clip ons and extending their lifespan. Not really on topic , but just wanted to say the port location contributes to many problems..even this. I agree with your comments about intensification around light rail stations but i dont see how you could get it there in the first place. I dont think residents on either side of the harbour with big sea views would stand for any new bridge constructed anywhere but the current location. And i dont see any govt or council spending a huge amount to put a light rail only tunnel the harbour. Road would have to be part of it i would think. So i wrote that the tunnel is the best option. I guess i mean its the one that can be done. if you want a pt only crossing of the harbour then how would you do it?. . I see heavier trucks (aka HPMVs) than are currently permitted on the bridge as being on the government’s hidden agenda. and what would be wrong with HPMV vehicles using the new tunnel? NZTA makes no secret of wanting to extend the routes cleared for substantially heavier trucks hence the fear-mongering re heavy vehicles on the clip-ons. It is being used to partially justify the additional crossing without explicitly stating that it facilitates heavier trucks. Bogus economic justifications based on deliberate obfuscation. An implicit definition of “productivity” that excludes great swathes of costs that are offloaded onto ratepayers and others. A cavalier approach to safety. So long as the tunnel includes rail it is a win-win because that means there is additional reason to invest in the CRL and a metro rail network in Auckland. Hard to see who is going to lose from this but if it is an election pledge and you don’t agree then vote Labour. It won’t include rail, because including rail will undoubtedly add additional costs. They will propose it as a motorway only that is ‘future proofed’ for rail, which means simply that a separate rail tunnel could be built sometime later. -All New Zealanders who have to bear the burden of of a five billion dollar think big boondoggle with negligible benefits ($750,000 every single day on cost of capital alone). -All New Zealanders who get yet another fuel tax rise to try and pay for some of it. -All Aucklanders who don’t get the transport investments they actually need because they spent ten years of the budget on one ineffective project. Want your roads paved in Rodney, keen to see a NW busway? Push that all back ten years. -North Shore residents who have to pay the $8 toll on both the new tunnel and existing bridge, after putting up with five years of construction closures. -Northcote residents who get a new spaghetti junction on their waterfront, St marys Bay residents who get a smokestack to look at. We need the new harbour crossing to help feed the new Puhoi to Warkworth holiday highway approved today. How else is the average South Aucklander going to get to Matakana for holiday? I give up trying to moan about the National governments loopy roading projects, they have already lost the plot and “Holiday Highway” is just what we need to make sure that the nail in the coffin stays shut! I don’t think you can under estimate how taking 4 minutes and 30 seconds off the trip to Warkworth will benefit the economy of the North. But Big Gerry is on to it, and as we all know, armed with this knowledge he and his officials have tested the economic benefits of taking a few minutes out of the ChCh -Wellington trip. Thanks Gerry for all the wonderful changes that you are making to the NZ roading system, but most of all to Fonterra that currently we can almost afford to pay for it.